AluFab carries a large inventory of both metric and fractional extrusion and their accessories. Our extensive inventory of the most commonly used, equivalent profiles of Bosch, Item and 80/20 are available for immediate shipment in strut lengths up to twenty feet. Accessories, brackets, fasteners and hardware for all available profiles can be shipped from our facility within 24 hours of receiving your order. View details and product catalogs. Or Contact Us, and let us know what you need. Shimless Industrial Linear Bearings are designed to be used in both low and high acceleration/deceleration applications. The Shimless Industrial Linear Bearing contains special threaded inserts in the pads that allow for a more heavy duty bearing in your aluminum extrusion assembly. 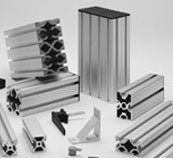 The Shimless Industrial Linear Bearings can be used in applications such as actuators, parts transfers, or pick and place operations. View details and linear motion product pages. Or Contact Us, and let us know what you need. Order your ready to assemble project in kit form. You can utilize our machining services so that all you have to do is put it together. We provide all machining services required to accommodate any part that we offer. Anything from miter cuts, counter bores, access holes, taps, panel cuts and custom milling services, we do it for you. If you want a part custom machined call one of our customer service representatives. Custom machining is one of our specialties. View details and product catalog. Or Contact Us, and let us know what you need. Save your company engineering time and labor cost. Let AluFab’s trained engineering staff take your concept or idea and turn it into a working print ready for your approval to be machined and built. Your order will arrive at your door assembled, cleaned and ready for use. Or let AluFab’s installation team assemble your project on-site. View details. Or Contact Us, and let us know what you need.